The church building that collapsed in Lagos last week, killing dozens of people, was owned by one of Nigeria's best-known evangelists, TB Joshua. The BBC's Tomi Oladipo profiles the popular preacher who has claimed to perform miracles, including curing blindness and people with HIV. From a country littered with burgeoning churches, Temitope Balogun Joshua, or TB Joshua, as he's known, is one of the biggest exports of Nigerian charismatic Christianity. Prophet Joshua was born to a poor family on 12 June 1963, claiming to have been in his mother's womb for 15 months. Later in life he claims to have seen a vision in which popular biblical figures commissioned him to preach and perform miracles. It was then that he started The Synagogue, Church of All Nations (SCOAN), with eight members. Today, like other popular Nigerian preachers or "men of God", TB Joshua is wealthy, influential and highly revered for the office he holds. People come from around the world to the SCOAN headquarters in the Ikotun district in Lagos to seek healing and to witness prophecies. When the Ebola outbreak began in West Africa, the Lagos State government, recognising the vast reach and influence of this preacher, asked that no victims of the disease be brought to the church for healing so that there was no threat to other members of the congregation. He agreed to suspend some of the church's healing programmes but he is said to have sent 4,000 bottles of "anointing water" to Sierra Leone that he says could cure the disease. TB Joshua says this special water, delivered in small bottles, positions users "for mercy, favour, healing, deliverance, blessing, prosperity and fruitfulness". However, in 2013, the desire for the anointing water led to the death of four people in a stampede in the Ghanaian capital, Accra. The deaths occurred when members of his church rushed to the alter to receive the water. The preacher was criticised following this incident but police in Ghana said it was difficult to apportion blame. Best known for his prophecies, TB Joshua claims to have predicted numerous events, from the death of Michael Jackson, to the disappearance of the Malaysian plane MH370. In the case of Michael Jackson, TB Joshua said to his congregation: "In his own area he is famous. He is known everywhere. Great. Too great. Because I see something will begin to happen to that star and that will likely end in him to pack his load and go to the journey of no return but I don't know when that journey [is]." After Michael Jackson's death, the preacher claimed this was the subject he had spoken about six months earlier. His critics have described his predictions as vague and able to be manipulated to suit any event. This has not deterred the thousands of followers who throng his church services seeking direction. The South African politician Julius Malema, Malawi's former President Joyce Banda, Zimbabwean politician Morgan Tsvangirai and the former president of Ghana, the late John Atta Mills, are among the prominent Africans who have paid homage. One arm of the SCOAN is Emmanuel TV, a television station that broadcasts the preaching of TB Joshua around the world, as well as the accounts of people who say their lives were changed for the better because of this ministry. The testimonies include stories about financial prosperity, inexplicable recoveries from illness and even people being awakened from the dead. Prophet Joshua is also known for his charity work - and Nigeria's former president, the late Umaru Yar'Adua, awarded him the Order of the Federal Republic, one of the country's highest honours. One of his prominent projects is My People FC, a football academy which has produced at least two of Nigeria's bright prospects: Ogenyi Onazi, who plays for Italy's SS Lazio, and Sani Emmanuel. 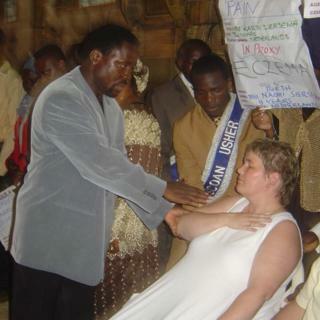 Many Nigerians refrain from criticising preachers like TB Joshua. However, the growth of the internet and social media has revealed increasing opposition to wealthy mega-church pastors. "We don't subscribe to his brand of Christianity so we cannot endorse what he does," said one Anglican bishop, who refused to be named.